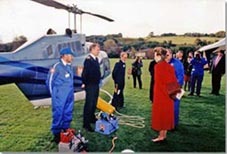 Heli-Aid is a charity formed in 1991 and registered with the Charity Commission in 1993. The aims of the charity are to provide suitably qualified pilots, helicopters and crews for emergencies, disasters or the prevention thereof, and emergency aid throughout the world. Heli-Aid was originally formed to react quickly to situations abroad, liaising with organisations like Rapid UK to provide helicopter assistance. An example of this would be to provide reconnaissance of an earthquake region to provide vital information as to what further support is required.